The black Selador Desire D40XT Vivid LED Fixture with Edison Connector from ETC can withstand heat, cold, rain and snow, without skimping on lighting features. The durable Desire D40XT luminaire has an IP rating of 66, meaning that the unit’s housing completely protects the electrical components from dust, water, and the formation of ice, and can withstand temperatures ranging from -4 to 104°F (-20 to 40°C). From coatings and seals, to vents and cord grips, the D40XT fixture’s hardware can stand up to extreme temperatures, UV rays, and atmospheric changes. And the luminaire’s attached cabling is UL Listed for extra-hard usage and outdoor ratings. 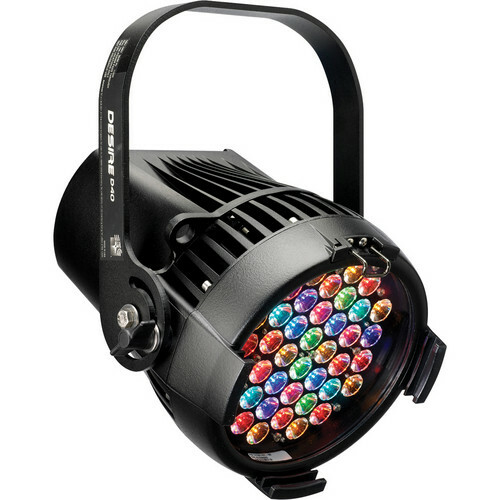 The D40XT luminaire features 40 high-efficiency emitters. It also includes a user-interface with an expanded LCD display for control options. Quick Setups like General, Stage, XT (Exterior)/Architectural, High-Impact, and Studio simplify your lighting tasks, by giving specific operating behaviors for any application. The x7 Color System combines up to 7 different LED colors on one unit into the D40XT fixture so you can take dazzling colored and crisp white light outdoors where you need it. The x7 Color System carefully balances its lighting to give you a range of adjustable color options to fit your needs. The Desire Vivid fixture is a high-brightness, color powerhouse, and provides deep, saturated color for your outdoor installations. A rugged, die-cast enclosure, noiseless fan-free operation, multiple lens options, and advanced user interface make this fixture a great choice for multiple applications. It is suitable for working outside at festivals, theme parks, video shoots, and architectural installations. Note: All LED sources experience some lessening of light output and some color shift over time. LED output will vary with thermal conditions. Ambient temperatures and orientation affect thermal conditions. Based on the LED manufacturer's B50 l70 specification, a Selador luminaire will achieve approx. 70% of its initial output after 50,000 hours of typical usage. In individual situations, LEDs will be used for different durations and at different levels, which may eventually lead to minor alterations in color performance, necessitating slight adjustment to presets, cues or programs.